Many lawyers have sons and daughters who enter the profession, but few parent-child combinations are as potent in the courtroom as the Salvis. Last year, plaintiffs’ lawyer Patrick A. Salvi II, just 10 years into his law practice, joined his father Patrick A. Salvi on the Lawdragon 500 guide for earning massive recoveries for injured clients and their families. Among his recent successes, the younger Salvi won a $148-million verdict last August for a young woman paralyzed by a fallen shelter at O’Hare International Airport. 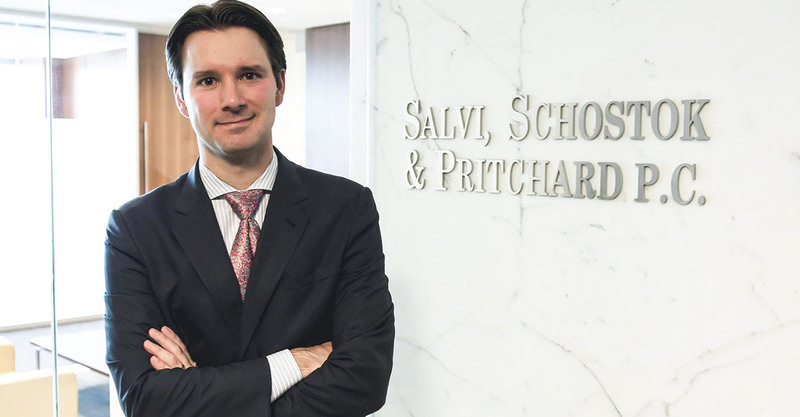 Also in 2017, Salvi became managing partner of Salvi, Schostok & Pritchard’s Chicago office. His brother, Brian, and Brian’s wife Eirene are associates at the firm. Lawdragon: Of course, you had a great role model in your dad, but did you consider doing something else professionally? When did you know for certain that you also wanted to have a plaintiffs’ practice? Patrick Salvi: It took time. I knew during college that I wanted to go to law school. But in my mind, I figured that could land me at my dad’s firm or I could become a sports agent or something in politics. I took a liking to trial work while in law school, so that directed me to Salvi, Schostok & Pritchard. For the first few years, I considered whether this was the right work for me. As the work became increasingly important, and certainly as I started trying cases, I knew I wanted to completely devote myself to helping victims achieve justice in the most remarkable way I can imagine – trial by jury. It’s a beautiful thing that I will fight for as long as I’m breathing. LD: You’ve had an impressive string of large jury verdicts. Can you share a few factors that you feel have been key to your success in recent years? PS: I’m blessed to be at a firm where I have received amazing tutelage. We also are able to handle important cases. We have the resources to hire the best experts and put on the best presentation at trial. I have become very involved at the American Association for Justice, which has opened my eyes to incredible trial lawyers and strategies that have improved my ability to communicate. I have a long way to go, but I think I have done a fair job at taking the incredible gifts I’ve been given as a relatively young lawyer – I can’t believe I’m already out 10 years – and trying to capitalize by becoming as good at trial work as I can. I have read many books, other lawyers’ closing arguments, and I have had the benefit of working with some great lawyers directly on cases: the late Mike Schostok, the recently-retired David Pritchard, relatively new partner (almost 4 years) Jeff Kroll, and of course my dad, Pat Sr. Each of these four attorneys have distinct styles, from all of which I have taken a little piece for part of my arsenal. I mix in my own style and figure the recipe isn’t quite done being perfected yet. LD: How would you describe your style as a trial lawyer? How do you get juries to see events from the perspective of your clients? PS: I used to be a bully for opposing witnesses – bad idea. I have learned a lot, both by reading anything I can get my hands on and by failing miserably. Perhaps most importantly, I developed the confidence to be myself. I would describe my style as being friendly, prepared, and altruistic. I try to instill in the jury a sense of altruism, where they can render a verdict that is fair for the case, good for the community, and in line with what most people believe are important values. I want to be the most prepared lawyer in the courtroom. I also want to be the most energetic lawyer in the courtroom. I want the jury to look forward to my turn with the witness, or in opening, or in closing. I try to be short so as to not waste the jurors’ time. I’m not as interested in getting the jury to see things from my client’s perspective as I am in having the jury see how what happened to my client fits in with a society of rules, and whether the jury wants to do anything about that. At the end of the day, the jury system is an important function of democracy, and our country, and in that sense the world is shaped in part one jury verdict at a time. LD: Can you describe a recent case you’ve tried? The O’Hare incident leading to the $148-million verdict must have been memorable. PS: The $148-million verdict was a special case. I was fortunate enough to have the confidence of the trial team to have been brought on the case about a month or two before trial. I was given the privilege of picking part of the jury. I also was given the privilege to get to know and ultimately present at trial all of the family members, except one sister. That was my primary role. I was also involved in some of the strategic decisions, like how much money to suggest to the jury or what video to use during opening. It was really an honor to represent this young woman. She suffered perhaps the most horrific long-term injury a human being can suffer. While our opponents tried the case admirably, we were fortunate to get an amazing group of citizens as our jury – not because they were open to big numbers (obviously they were) but because they paid attention and viewed the case as human beings. People that are paralyzed and have daily chronic pain live a very difficult life, though thankfully there aren’t too many people with such a devastating injury. But, as I say about this practice, there should be less cases and bigger verdicts. What I mean by that is insurance companies, corporations, and individuals should behave in a safe manner such that these things don’t happen – but when it does, harm should be expensive. It should be expensive to cause pain, suffering, disability, and disfigurement to another human. It should be expensive to tear away a person’s hopes and dreams at the age of 24 and subject the individual to a life time without the ability to walk. LD: What were the key challenges of litigating the case? PS: Her biggest challenge was simply putting her family, friends, and doctors through the trial. It was also hard on her. She deals with enough on a daily basis. It was difficult for her to know that the case meant that people would have to fly in from around the country and that her doctors would have to take time from their practices on her behalf. Even though every single witness of ours was eager to testify on Tierney’s behalf, she still – to this day – does not like burdening others. LD: What is the impact on the client or the industry from this case? PS: That remains to be seen. Hopefully, the matter comes to a successful conclusion, because as of yet, no money has been paid. We are currently in the post-trial phase. At the very least, this verdict should mean that people act more safely with public, and private, structures, and that if something like this happens, they know that a jury will award what is true value to the enormity of the loss. LD: Is there a specific lesson you drew from this case? PS: Push the envelope on damages. If you present your case correctly for a worthy victim, they’ll get it. Being injured is rotten. Pain is devastating. People get that. Less cases, bigger verdicts. LD: Obviously, there is a family connection, but why did you choose Notre Dame over other options? Was there a close second? PS: My fall back was Loyola, which is a great school. I was fortunate to have been accepted, and I would have gone there if not Notre Dame. Notre Dame, when I was accepted, was basically the family’s favorite football team. Now, it’s a part of our family fabric. Four of the five boys have degrees from there, with the one that did not going to Loyola and still a big fan. Two of my brothers played football. Brian, who practices with me, is a “double-domer.” I like to think I had a hand in starting that trend, but at the time, it was a special connection with my dad, a great school, a football team I already cheered for, and close to home – two hours away, versus University of Colorado for undergrad. The bond only deepened from there. LD: Did you have a favorite class or professor that was particularly influential in your studies or future career? PS: John Gallo has to be one of the most admirable guys I know. He taught white collar crime. A former partner, head of litigation at Sidley, now executive director at the Legal Aid Foundation in Chicago. Formerly a prosecutor in the U.S. Attorney’s office, who rose to a very high level before leaving for the private sector. He made class fun, much like how I want to make trial fun for the jury – to an extent, it’s serious but it needs to be interesting. He has been and continues to be influential in doing the right thing, working hard, and having a smile all the while. He’s awesome. LD: What do you think makes Notre Dame a great law school? PS: The people are just incredible. When I showed up, I graduated from Colorado with a decent GPA, felt like I was kind of smart, and figured I could keep pace. I realized quickly that my fellow classmates were Rhodes scholars, Peace Corps members, NCAA athletes, had already been successful with prior employment, and on and on. That motivated me to pick it up and become a better student. The professors are top notch. Even though I’m quite liberal politically, and Notre Dame is not, they still foster an environment of open discussion and mutual respect. LD: What advice do you have for students who want to have a plaintiffs’ practice like yours? PS: Go to trial, read everything you can get your hands on for trial advocacy, watch great lawyers, and find a mentor. To accelerate your abilities, you have to do all of that. There is no shortcut to becoming a great trial lawyer. LD: What was your first multimillion-dollar verdict or other significant result from early in your career? PS: My first case as first chair was in 2009. It was a case where my client broke her leg badly and her knee, as well. The defense offered $350,000. We went to trial. I picked part of the jury, opened, put on the important witnesses, and closed. I remember writing on a piece of paper “$750,000?” and motioning with my thumb “above or below” to my dad before the verdict was read. The verdict was almost $1.3 million. The client was ecstatic. She started crying. I started crying. Even though I still didn’t know much, it made me want to get to trial more. I’ll never forget the feeling that night sitting at my parents’ house with my mom and dad. A young girl, whose tibia had been broken so badly it went through the skin and needed a rod, received just compensation for the life-altering leg injury she suffered. The insurance company didn’t understand that, but the jury did. I had a small part in making that happen. I say small, because the client and what he or she has gone through is always the biggest piece to the jury trial puzzle. LD: Can you describe the case and any memories that stand out, or lessons you learned? PS: I learned that it’s the little things that make the difference. For example, the treating doctor did not give a very favorable deposition, because he said she would not have arthritis in her knee. This was a key issue. With great preparation and extensive discussion with my expert, I determined a fool-proof way to get the doctor to admit there was arthritis in the knee during his testimony, and he did. That was a key development during the trial. That doesn’t happen without attention to detail and execution. PS: I prepare a lot, and probably spend too much time contemplating every little area of every witness examination philosophically when I could be more efficient. I’m working on that. But my favorite thing to ask my trial team is the night before jury selection, I look at the office window and say, “Somewhere out there, 12 people are going to bed tonight who are going to decide my client’s case.” What an amazing system we have. That always gets me excited. LD: We notice a few other Salvi names on the firm masthead. What’s it like to practice with family members? PS: I love it. Brian and I are very close. His wife, Eirene, is awesome. She is a terrific lawyer and person, and very easy to work with. At the end of the day, it’s mutual respect. We may disagree at times, but with mutual respect, it should always end well. My dad and I have grown from a mentor-mentee relationship to something closer to a mutually beneficial professional relationship, though I still have dad when I have that tough question to which I don’t know the answer. We all mutually benefit from one another, and as long as that mutual respect exists, which includes working hard, respecting others’ opinions, and eagerly wanting to learn from one another, the work together is both professionally satisfying and fun. PS: I hang out with my wife, son, and newborn daughter. After that, my brothers. I have four of them, so that’s a lot of friends to begin with. Family is #1 no matter what. Work obligations take up a lot of time, which is of course necessary to provide for my family, but when the bell rings, I can’t wait to see Julianna, Patrick III, and Victoria. I also began playing the guitar earlier this year, which is a trip. I love it. I’m a huge Grateful Dead fan. I also play hockey, though that’s become a little trickier lately. I try to find some fun day to day, because as we know from this line of work, life can change in an instant. Always enjoy what you have, even if it’s just what you have left. LD: Are you involved in any pro bono or public interest activities? Please tell us what you find meaningful about your time serving them. PS: I used to serve on the board of a large Catholic school on the southwest side of Chicago, St. Agnes, though I recently stepped down. I remain supportive of several organizations, such as St. Agnes, Michael Matters (for people with brain tumors; named after Michael Schostok, who died of a glioblastoma), and some others periodically. But this is one area of my life that needs a little more action. John Gallo’s recent appointment as Executive Director of the Legal Aid Foundation has motivated me to do more, and that is one organization I want to become more involved in, especially under his leadership. Helping others in need is important, and it’s time for me to do more than what I’m doing. LD: Do you have a favorite book or movie about a court case or the justice system? PS: Rainmaker is up there. Little guy, Matt Damon, against a defense-oriented judge (until he passed away and Danny Glover took over), a big health insurance company, and the big-bad defense lawyer played by Jon Voigt. The courtroom scenes aren’t entirely an accurate portrayal of what would be allowed or what would happen, but the story can be spot on with respect to what we see in some parts of the state or in some cases depending on who is defending the case. John Grisham captures the plaintiff-defense dichotomy very well in that story. Puncture is another movie, starring Chris Evans, about a young lawyer, who is troubled with addiction but very talented, who uncovers a massive scandal in the healthcare industry. Similarly, it’s big guy versus little guy and that resonates with me. Both of these movies tell me – someday it will be your moment, so be ready. And as I told my dad, I can’t have the biggest verdict in my career at the age of 35. Until the next case with that much verdict potential, I’ll have to keep my eyes open.